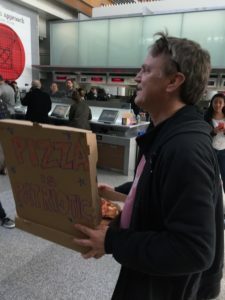 Someone at the Cheese Board had the idea that we should make and bring pizzas to the San Francisco International Airport to feed folks who had come out to protest Trump’s Executive Order on Immigration. 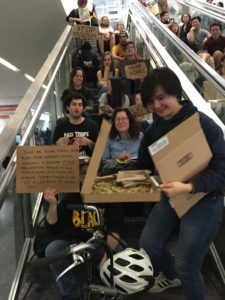 About 10 of us met at BART and traveled with 30 boxed pizzas and napkins. 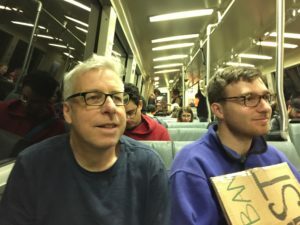 We met a lot of people on BART with the same idea —not pizzas—but traveling to the airport to protest. We were glad we went. It felt like the beginning of doing something. The Cheese Board Collective is committed to human rights, civil liberties, diversity, integrity, and a just economy. The bakery & cheese shop will be closing early on Saturday 1/21 to support the Women’s March and Rally. 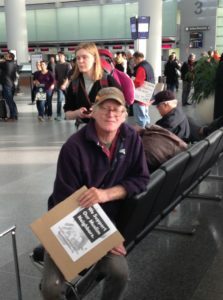 Please join us at the Oakland and San Francisco events. 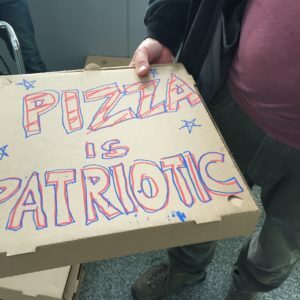 Stay tuned for Pizzeria hours on 1/21. 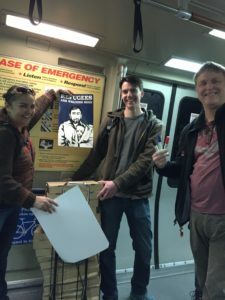 We’re excited about the new oven that was installed over our winter break! We think that this will make our breads even better and we’re looking forward to sharing them with you. As cheese-mongers, we are frequently asked how long a cheese will last. That question can mean a lot of things because cheese is the convergence of complexity, simplicity, magic, science, and art. The short answer to this common question is: cheese probably lasts longer than you can manage to not eat it. But mold does happen, and that’s not necessarily a bad thing. *If it’s a molding semi-firm or harder cheese, cut off the mold and eat the rest. *If it’s a molding soft cheese, remove the mold and eat it as long as the smell and flavor of the cheese hasn’t changed. Usually this is a blue/gray/brown mold that can be scraped off and the cheese is otherwise in good condition. If you are unfamiliar with cheese, you may not know how the cheese should taste so proceed with caution. *If the cheese is slimy in a way that it wasn’t before, probably don’t eat it unless you know what you’re doing. *Pink discolorations usually accompany an ammonia smell and bitter, repulsive flavor. Discard. *If the cheese is stinky in a non-desirable way (usually it smells like ammonia rather than umami and yeast), it’s on its way out. Taste it! Tastes good? Proceed. Tastes bad? Toss. *Cheese that has lots of holes (like Asiago Fresco) or cracks (like Poacher) will grow a blue-gray mold in those holes that can be cut out, scraped off, and eaten around. Mold is nature’s way of telling us that something else, other than us humans, has decided to partake in the cheese. This is often an integral part of the cheese-making process. Some cheeses are inoculated with mold spores which give rise to tasty flavors and pleasing textures. Penicillium Roqueforti, found in places like soil, caves, and moldy bread, is responsible for the blue marbling in of course, Roquefort, and a number of other blues like Stilton, Cabrales, and Point Reyes Blue. Penicillium Glaucum is the fungus used in a great many other blue cheeses like Gorgonzola, Bleu d’Auvergne, and Bleu de Gex. But mold isn’t limited to blue cheese! Geotrichum Candidum is a fungus that causes sour rot of citrus fruits and some vegetables. Under specific circumstances, it can be the source of a disease called geotrichosis!!! However, when it is added to milk during the cheesemaking process, it will produce the flavor and structure of brie. One of the differences between industrial cheese versus traditional artisan cheese is the extent to which wild, unfettered, free-wheeling mold takes over. Many modern cheeses are made in sterile and extremely well-controlled environments so that only specific microbes are at work. This ensures the outcome of the cheese, so the flavor is consistent, as well as the safety of the cheese, to prevent harmful microbes like E. Coli and listeria. Traditional cheese-making practices, such as using raw milk, making cheese on a farm (in proximity to farm animals), and using cultures from previous cheese batches, can but don’t necessarily open to doors to harmful microbes. In the microbial-rich environment of traditional cheese-making, you can have dozens of bacterias, fungi, and yeasts that all pass on a wealth of flavors and complexities to the cheese. Some cheeses have an unpredictable variety of surface molds which also contribute to the cheese’s unique flavors. Often these surface molds spread to the interior of the cheese, especially if there are holes or cracks. This is common among British farmhouse cheddars. That molding is, in part, why they develop their complex, earthy, and rustic qualities. Next time you pull a moldy piece of cheese out of the refrigerator, think about the life that exists on that fertile, milky, microb-land. Then thank those fungi for the cheese they have given us. The Bakery is closing at 3pm on Saturday, January 21st to join those marching in San Francisco. Rain or shine. See you there.